Indians starter Danny Salazar (0-1) struck out 10 in 3 2-3 innings, becoming the first player in Major League Baseball's modern era to to so in less than four innings. CHICAGO (AP) — Rookie Jose Abreu connected for his second multihomer game in three days and the Chicago White Sox ended a 14-game losing streak against Cleveland, beating the Indians 7-3 Thursday night. Abreu hit tape-measure drives in the second and fifth innings and drove in three runs. The Cuban slugger hit the first two homers of his major league career Tuesday in Colorado. Abreu has four homers and 14 RBIs in 10 games. Alexi Ramirez homered and drove in three runs for Chicago. The Indians had outscored the White Sox 102-45 in a streak that dated to last June. White Sox starter John Danks (1-0) got off to a rocky start, but settled down to allow three runs and six hits in six innings. 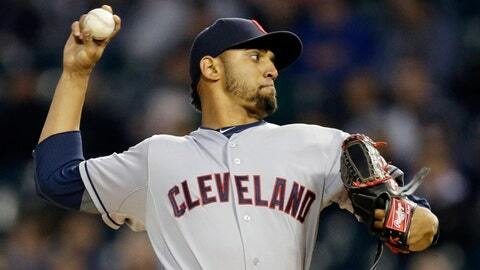 Indians starter Danny Salazar (0-1) struck out 10 in 3 2-3 innings. He also gave up five runs and six hits, including homers by Abreu and Ramirez. Salazar fanned eight through three innings, with the only non-strikeout out coming when Adam Eaton tried to stretch a single into a double in the third inning. Salazar’s problem was that when the White Sox made contact, it was solid contact. Cleveland staked Salazar to a 2-0 lead by scoring twice in the top of the first. Abreu homered to lead off the bottom of the second to cut the lead in half, but Asdrubal Cabrera got the run back with a homer leading off the third. The White Sox tied it 3 in the bottom of the third on a leadoff homer by Ramirez and an RBI single by Eaton. Chicago took a 5-3 lead and chased Salazar in the fourth as Ramirez drove home a pair with a double. Abreu later homered to left field off left-handed reliever Josh Outman.